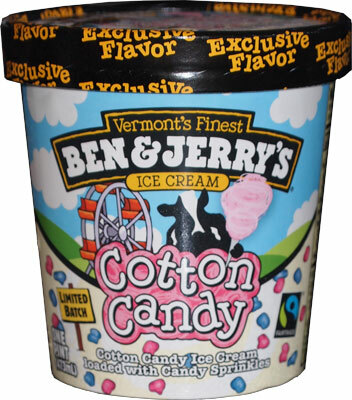 Ben & Jerry's Cotton Candy Ice Cream vs.
[Both New for 2013, B&J in scoop shops for early 2014, pints later. Both still around for 2015, Friendly's returned for 2016] Ladies and gentlemen, welcome to a very special festive edition of Friday Night Fights! Nothing screams summer like cotton candy, or better yet, children screaming FOR cotton candy, hehehe. To meet the pent up demand of young ones everyone, both companies have released a special treat for us. In this corner, we've got a pint of Ben & Jerry's Cotton Candy Ice Cream, a Walmart exclusive. I mean, it was a fight just to find this one. It's cotton candy ice cream loaded with candy sprinkles. I may be an adult, but I'll always be a sucker for sprinkles. In the other corner is a 48oz container of Friendly's Rockin' Poppin' Cotton Candy Ice Cream, an East coast limited edition exclusive... yeah, that sounds good. It's cotton candy flavored ice cream as well, but now we've got "poppin' candy" (also known as generic pop rocks). Lids are off... can you guess which one of these scares me? Wow, that's just... wow, super funky. Friendly's look is almost as cool as Schwan's triple chocolate ice cream, but in a more scary / kid friendly way. That pink is bubble gum flavor right? hehehe, just kidding. Ummm, ok, you go ahead and make your own judgement on this one. Yeah, I'm letting Ben & Jerry's throw the first swing here and it's... subtle, but yeah, I taste cotton candy, the lightest of fluffed sugar flavoring. Even the cotton candy aroma is subtle. I expected a more adult oriented version and I think I got it. The candy sprinkles are very soft, squishable, and kind of like the sugar crumble crust on a nice cold apple pie. The Ben & Jerry's continues onward, never landing any massive blows while the Friendly's just keeps punching. It's a strong flavor, but there is a certain something that keeps your attention. My daughter mentions the Friendly's is popping which I don't... wait, no, I hear my bowl popping! Not a lot, just a little. She says it's driving her crazy as she tries to eat it, so I let the ice cream sit on my tongue for a second... ha, it is popping! Quite a lot actually. Both me and my wife were just kind of happily crunching along but it takes a kid to point out the obvious sometimes. Ahhh, to be an old fuddy duddy. If Jones made a cotton candy soda (which I'm surprised they don't), then it would taste like Friendly's version. There's just that bit of carbonated pop to it. Actually, to be more precise, it kind of tastes like someone mixed a blue freeze-pop with some vanilla ice cream... or maybe mixed a blue raspberry icee with soft serve. Alright, the judges are collaborating... well, after judge #3 stops eating tostitos to get rid of the cotton candy aftertaste. Ok, let's go. The youngest judge prefers the sweeter, more potent Friendly's ice cream... if only they would ditch the pop candy. The second judge also prefers the stronger flavor of the Friendly's (and the visuals don't hurt). The final judge (me) is still kind of confused. I'm having trouble getting into the overpowering Friendly's, but at the same time the Ben & Jerry's is a timid flavor. If only the B&J had some cotton candy grit... or maybe a cotton candy swirl? I wish there was more here... though technically when I mix the two together, I get a more middle of the road flavor that could appeal to more people. Final Judgement: The votes are in, Friendly's wins! Can I ask where you found the Friendly's ? I'm on the east coast and can not find it ! I've seen it at several locations like Stop & Shop and Market Basket, maybe Shaws too. Just keep searching! Just wanted to add that I am 28 and addicted to the friendlies cotton candy Ice cream! Good to know ben and jerries makes one, I've got to try it! Im worried about the day they stop making my fave flavor! I just tried the Friendly's version of this ice cream and felt the need to look it up online, and here I am!This ice cream is great! I'm a middle aged man and didn't really mean to gauge it, but this ice cream certainly has the cotton candy flavor and those "pop rocks" brought me back to my childhood days! A bit sweet, almost sherbert-like, but gosh was it good! And the poppin' was a bit of a suprise/bonus! The inevitable day has come. September 10 2013, the friendlys rockin poppin cotton candy ice cream has been discontinued. My wife has been buying it religiously since april. My 4 year old daughter and I go through 2 cartons a week sometimes 3. She went to buy us our weekly quota today and the flavor was replaced by some other limited edition junk. She checked 2 different locations and both were stocked with the new flavor. This is truly a sad day! We have this and now 9/11 tomorrow! I don't know what I'm going to do! @N. Panaro: Sadly, Friendly's version was only out for the summer time. Now it has been replaced by Sundae Nut Football for the fall. @NPanaro: if you are desperate, you could always try the cotton candy ice cream from Target, I still see it on the shelves. I just love the Ben & Jerry cotton candy ice cream. It's an addiction of mine! Sad to think they only have out in the summer time. :( I feel that they should keep it on the shelves all year long. They make a better profit from it!!! Yum! Hershey's cotton candy ice cream is my crack. Where do u find the Hershey's brand? Our family is trying to get Friendly' s to make it in a cake or roll. Any suggestions in helping with this endeavor would be appreciated. We think this is a excellent flavor for birthdays or any special occasion. Friendly' s Rockin Popping cotton candy is the best and as noted hard to find. I stock up when Stop and Shop has any, they should at least make it in a carton. sorry, the Friendly's version was a limited edition flavor. I strongly suggest trying their 2014 ice cream cake flavored ice cream, hopeful it will fill the void in your freezer. Graeter's Ice Cream out of Ohio makes a crazy good Cotton Candy ice cream... but it's only available in their scoops shops if you live in a city that has one. 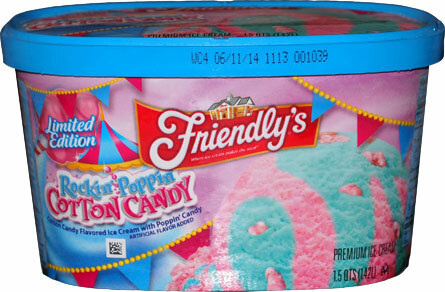 For those that like the Friendy's Cotton Candy flavor I seen Giant had it in the 12 serving container over the weekend. I went to Walmart and decided to try Ben & Jerry's after reading this post as an established Friendly's Cotton Candy Fan. Hands down, Friendly's is it! Ben & Jerry's has an aftertaste for sure, it lingers, but definitely lacks presence while you eat. Friendly's is full of flavor and tastes authentic, despite the coloring...at least they can back it up lol! I haven't had Cotton Candy flavored ice cream this good since Welch's Farms in my youth at a local ice cream parlor! P.S. I even like the Poppy Rock and miss the marshmallow topping with sprinkles they add in the individual size sundae. You can find Friendly's at most Shoprite Supermarkets on the East Coast. Food lion has friendlys cotton candy. My all time favorite besides Hershey cotton candy ice cream. I also live in mass and try my best to find a friendlys replacement but nothing beats it. Have you found anything?? Are you sure about that? It does come back every year but it's only at one time during the year.